Here comes a simple, fruit-lover-friendly little snack, coated in the super food (or fruit powder) of your choice and dipped in raw, white chocolate. Mmmm... :) This is a super-easy recipe that everyone can make and enjoy, sort of like the lazy version of a truffle. 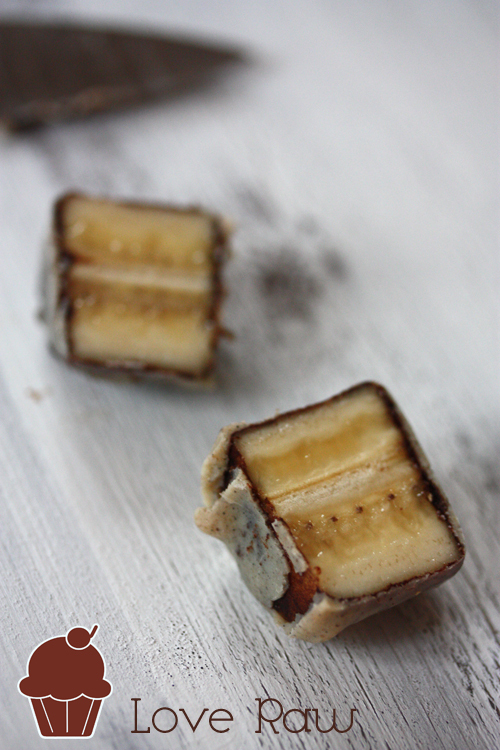 Bananas already have that sweet and creamy texture that is perfect for so many things. 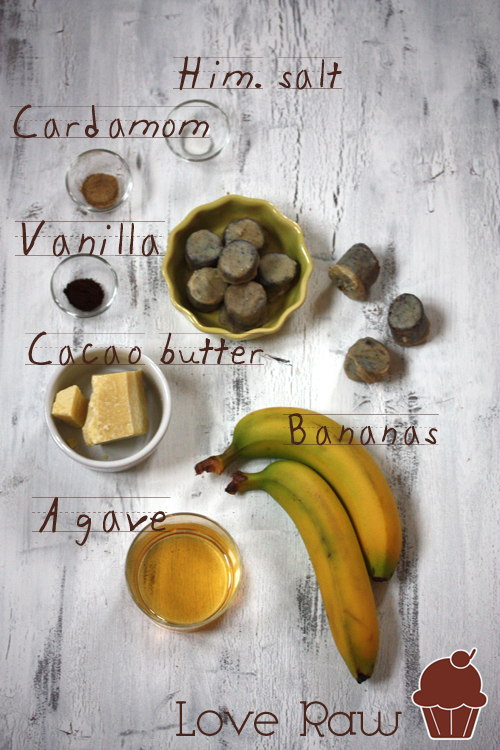 Tips #1: The white chocolate turns darker if you add real vanilla powder, dark agave and coat the bananas in cacao or carob. If you want it white, choose only light colored ingredients, like vanilla essence, lucuma, light agave or honey! Tips #2: You can sprinkle the chocolate dipped bananas with chopped nuts (pecans are always nice), cacao nibs, shredded coconuts, chia seeds, hemp seeds or whatever you fancy. Only make sure to apply the nuts/seeds when the chocolate is still wet, otherwise it won't stick. 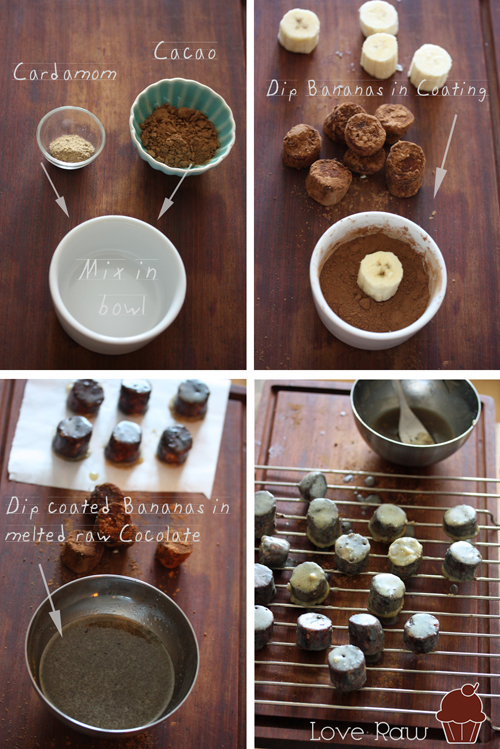 Tips #3: When dipping the bananas in the melted chocolate, make sure the chocolate have had some time to cool off. Newly melted chocolate will leave a thin layer after dipping. If you wait a couple of minutes it will thicken quicker. • 130 g or 1 cup chopped Cacao butter. Melt the Cacao butter in a water bath or in your dehydrator. Add Agave, Salt and Vanilla. Stir and put in the fridge to thicken. Don't wait too long as it will get hard quite fast in the fridge. Make sure to stir it while it's getting colder. Cut the bananas in pieces and dip them in the coating. When your melted chocolate has thickened a bit it's time to dip the bananas. If you have a grid to put them on, it's great. Otherwise you can let them rest on a silicone sheet. Dip them 2-3 times and make sure to turn them so they don't stick to the grid/sheet. • 130 g eller 2 dl finhackad Kakaosmör. Blir ca 1.5 dl som smält. Smält Kakaosmöret i ett vattenbad eller torkugnen. Tillsätt Agaven, Salt och Vanil. Rör om och ställ i kylen för att tjockna. Låt den inte stå där för länge eftersom den kommer tjockna ganska fort. Rör om då och då. Skär upp bananerna och doppa dem i paneringen. Doppa dem sen i den smälta chokladen. Låt dem rinna av på ett galler eller silicon underlägg alt. smörpapper. Doppa dem 2-3 ggr och vrid bananbitarna undertiden de torkar så att de inte fastnar på underlaget. • Do you happen to be Swedish? Great! Pay a visit to our webshop therawdessertkitchen.se to shop your super foods and find out more about how to use them and why they are so good for your body and mind! Here's where you go. • Not signed up for my free eLetter yet? Oh no... That means you're missing out on a lot of exciting stuff, like cool raw recipes, info and offers (mostly for the swedish readers). It's easy fixed though, sign up in the submission box to the right blog-column. See you there! • Want more? Then click like to The Raw Dessert Kitchen's Page on Facebook to get updates. And I'd LOVE to hear from you! Tell me what you think about stuff, your opinion and feedback means a lot to me. Super Breakfast for a Superman.